These form the core of the two permanent exhibitions, which are not only augmented by other exquisite collectors’ pieces from the world of clocks, but also complemented by special presentations and "guest" items. Those wishing to enrich their visit with additional background information may attend a themed "Museum at lunchtime" tour led by the Curator on the last Friday of every month. In addition, audio guides in three languages are always available. 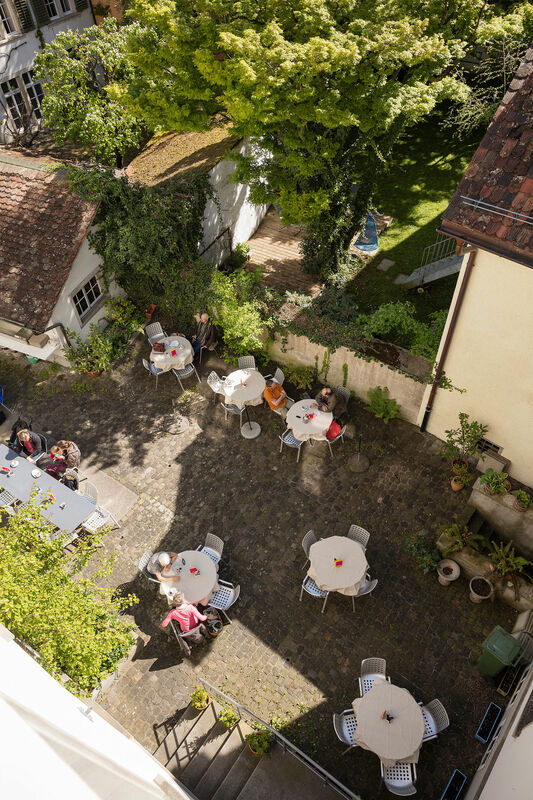 Visitors can enjoy coffee and cake or a freshly cooked meal in the Grand Café du Musée. The leafy courtyard is also an inviting spot in which to relax during the summer months. Do you have any questions about the collections or programme of the Clock & Watch Museum Winterthur? The Curator, Brigitte Vinzens, is an acknowledged expert who will be happy to provide information. If you would like to book a private tour or receive the half-yearly programme, please contact this address directly. The Patrons’ Association of what was then the Kellenberger Clock and Watch Collection was founded in 1999. When the collection was renamed the Clock & Watch Museum Winterthur in 2017, the Association also changed its name to the Clock & Watch Museum Winterthur Patrons’ Association. Its purpose is to foster the aspirations of and provide financial support for the Clock & Watch Museum Winterthur, which is owned by the City of Winterthur, with the aim of enriching the collections through suitable acquisitions. In addition, it organizes events to publicize the Clock & Watch Museum Winterthur, as well as holding social and cultural events for its members. The Association is a not-for-profit group. From exquisite sets of postcards featuring highlights of the Konrad Kellenberger and Oscar Schwank Collections, to illustrated catalogues explaining more about the collections – the shop at the Clock & Watch Museum Winterthur will inspire you to give yourself, your family, friends and acquaintances a little time for time.